You know how much I love the Ikea “as-is” section with it’s 50% off cabinet doors and scratch and dent furniture. Well, last time I was there I picked up a couple of shadow boxes for 50% off. They were scratched, but I knew I could repaint them so they'd be good as new. Under $5 for a 9x9 shadow box was a pretty good deal. I wasn’t sure what I was going to do with it, but I knew I could come up with something. Anyhow.. I was going to print it out in a single font, when I stumbled upon this free printable from Lil Luna. Now to fix up the inside of the box. I originally just flipped over the paper that was behind the photo mat so that the background would be white, but I didn’t like that. I didn’t think my slips of paper containing my ‘blessings’ would show up. I grabbed some glitter spray paint (this stuff is AWESOME! I’m not sure why I’ve never used it on projects before) and painted the paper. Ideally, buying glitter card stock would have been better, but like I said, I was doing this last night (and the post is going out this morning) so I used what I had on hand. Here is a close up of the vinyl words against the gold background of the box: I’m glad I didn’t use the white. The slips of paper definitely show up better against the gold. I do love the final product, and I can’t believe it took me less than an hour to make. Tomorrow I am going to drill a small hole in the side of the box to insert the slips of paper through. 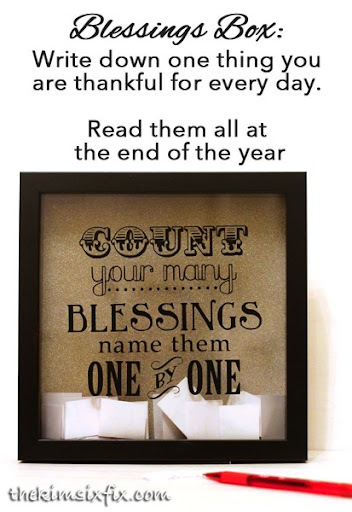 I’m already feeling more Thankful!